While conducting our initial livelihoods assessment in Daan Bantayan municipality (in Northern Cebu), I met this lovely couple, Amelito and Mary-Ann Bantilan, who live in PayPay Barangay (PayPay village). I was really struck by their story, and by their incredible resilience and optimism in the face of such a catastrophe, so I thought I would share it with you. 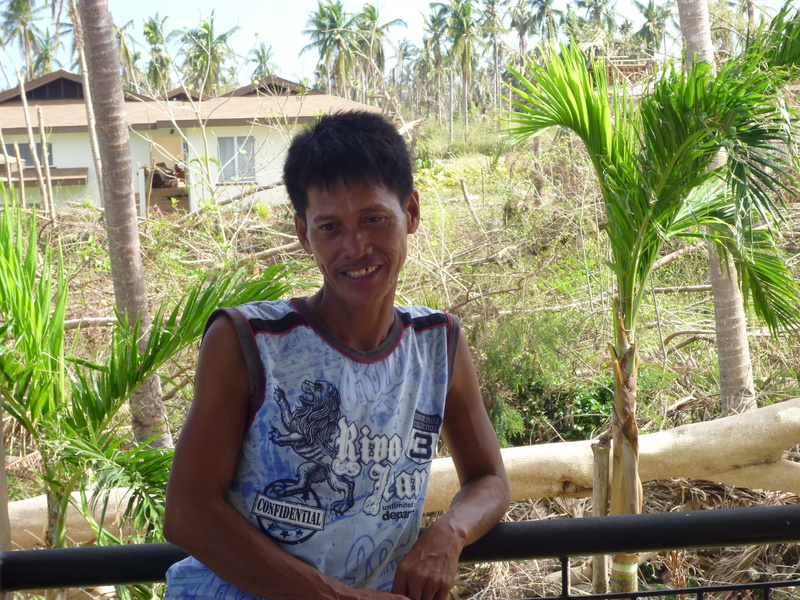 Amelito is 42 and a fisherman who lives in PayPay village. He has a small paddle boat and a net, both of which were damaged in the storm, though he is still able to use them to fish (his boat has a small hole in it, so he can’t go out too far). His net has some holes in but is still just about usable. He normally fishes in the morning and evening, and catches around 4kgs of fish per day. He keeps back a small amount of fish to feed his family (he has a wife, Mary-Ann, and 7 children, 3 boys and 4 girls) and sells the rest of his catch.